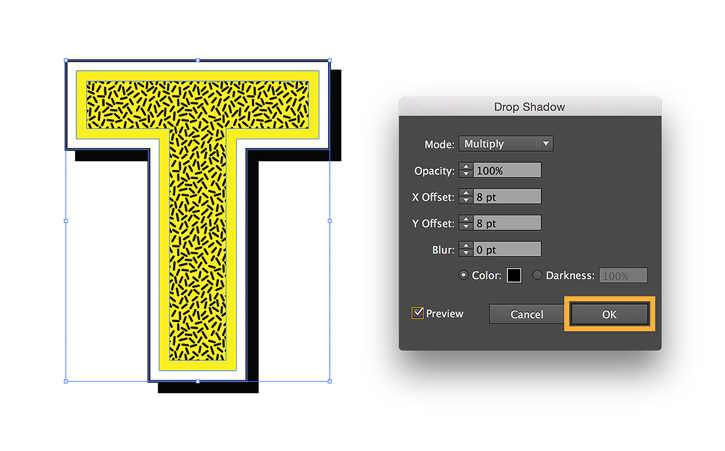 Learn how to create a custom drop cap in Illustrator and use it in an InDesign text layout. 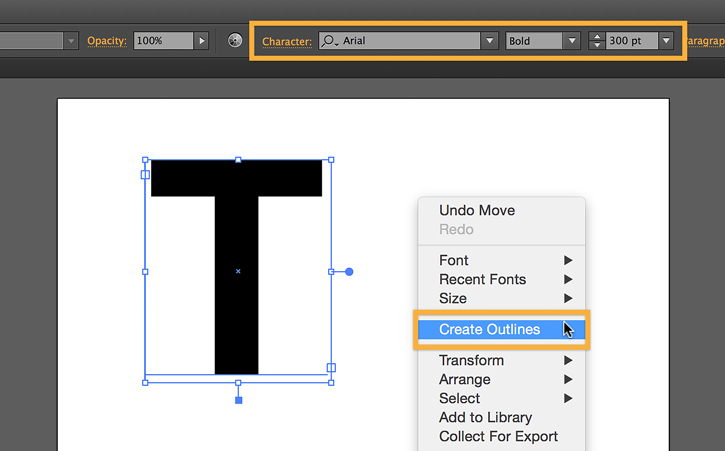 With the Type tool (T) selected, click Character in the Control panel. Select Arial Bold and and set the font size to 300 pt. Click on the artboard and type a letter. Press Esc, then right-click and select Create Outlines. Select Object > Path > Offset Path. Check Preview, enter an offset value of 8, and then click OK. This creates a duplicate path offset from the original path. Repeat the previous step one more time to create three concentric paths. 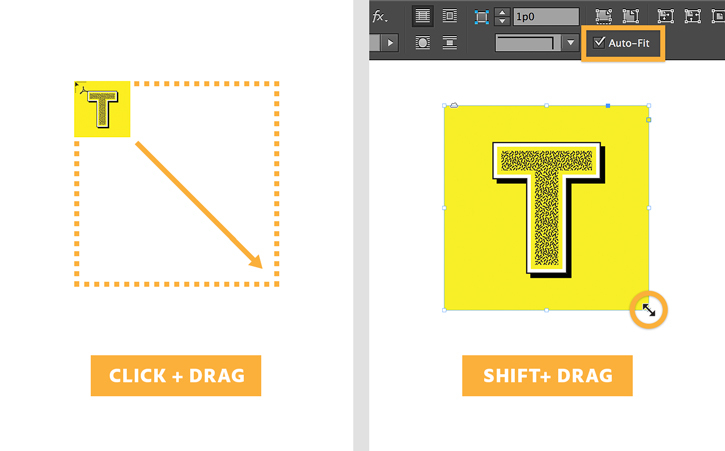 Drag a selection marquee around all the paths and type Control/Command + Shift + G to ungroup. Select the outermost path and fill with white, and set the stroke to Black. Select the middle path and fill with any color of your choice; we chose yellow. You'll apply a pattern to the innermost path. Go to Window > Swatch Libraries > Patterns > Basic Graphics > Basic Graphics_Textures. 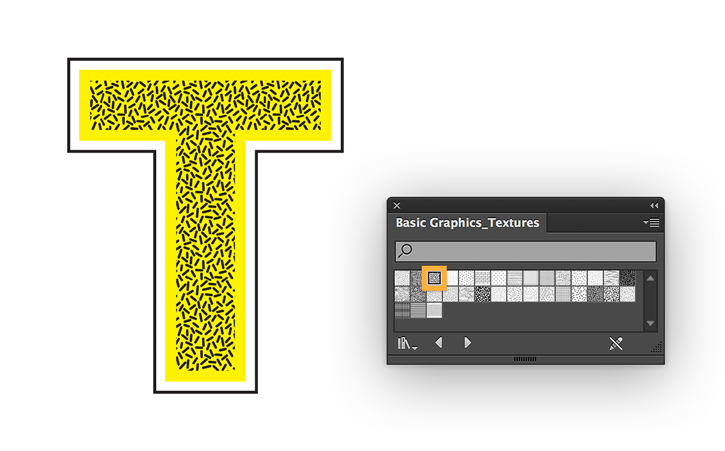 Select the innermost path and click a texture from the Basic Graphics_Textures panel. We chose Capsules. 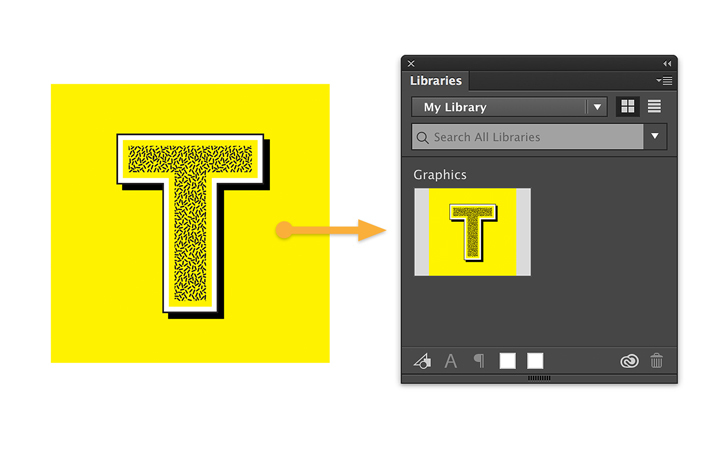 See Create and apply patterns to learn how to define a custom pattern in Illustrator. Drag a selection marquee around all the paths and type Control/Command + G to group all paths. Go to Effect > Stylize > Drop Shadow. Check Preview, then set Mode: Multiply, Opacity: 100%, X & Y Offsets: 8 pt, and Blur: 0 pt. Then click OK. Optional: You can add a frame to the drop cap for flair or emphasis. Draw a shape around the drop cap and fill it with a color of your choice. Then right-click and select Arrange > Send to Back. Go to Window > Libraries. Type Control/Command + A or go to Select > Select All. 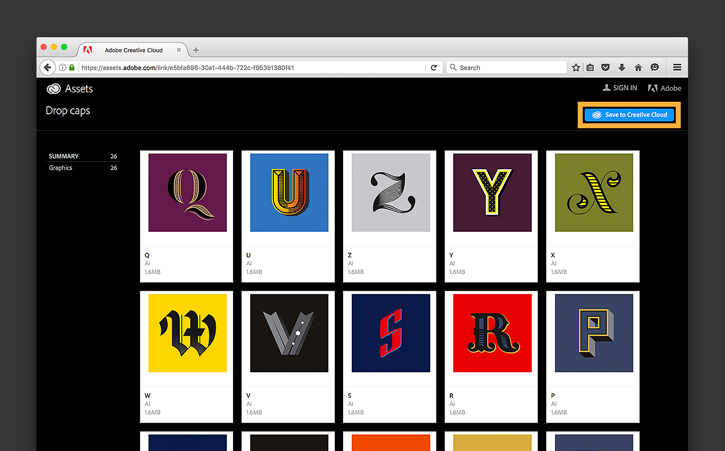 Drag the drop cap over to My Library—it's added to the Graphics section. 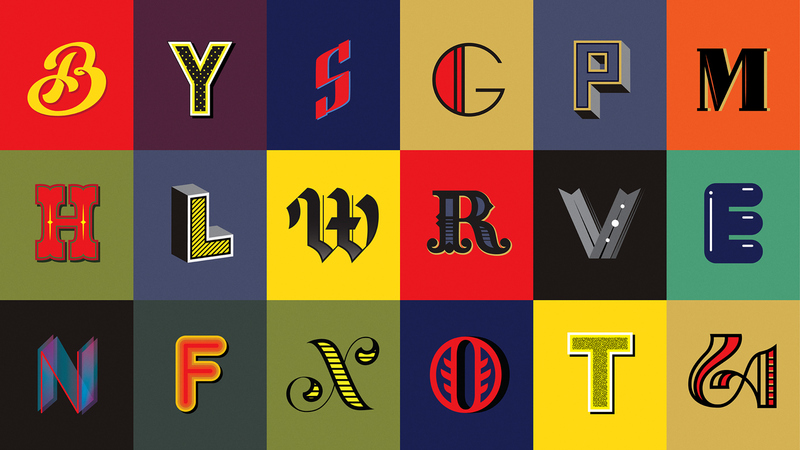 Now you can create a whole drop cap alphabet and reuse it in another Illustrator document, and in other Adobe desktop and mobile apps! Launch InDesign, and open a document with text. Go to Window > CC Libraries. Click the drop cap in the Graphics section and drag it anywhere on the page. With your cursor loaded with the drop cap, click and drag a rectangular frame. 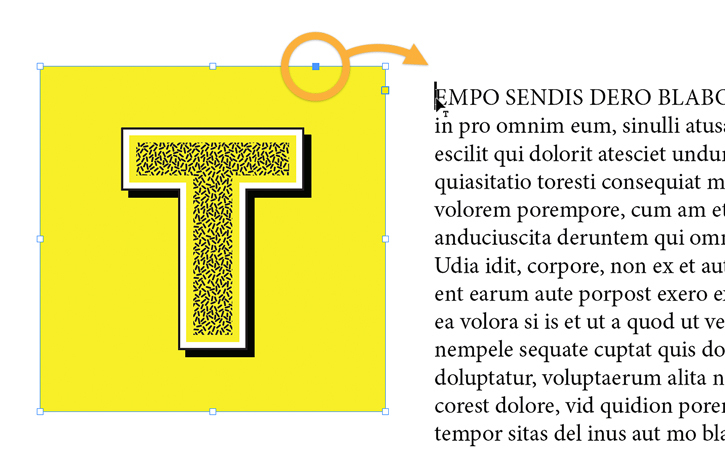 To resize the drop cap and frame proportionally, type V and select Auto-Fit in the Control panel. Then Shift + drag a corner handle of the frame. In the next steps, you'll set up the drop cap as an anchored object so it flows with the paragraph text; and set the text to wrap around the drop cap. To anchor the drop cap in the text, press Shift + drag the blue square at the top of the frame and position your cursor at the beginning of the text. At this point, the blue square changes to an anchor icon. Once the drop cap is anchored to the text, you can adjust its position relative to the text frame. 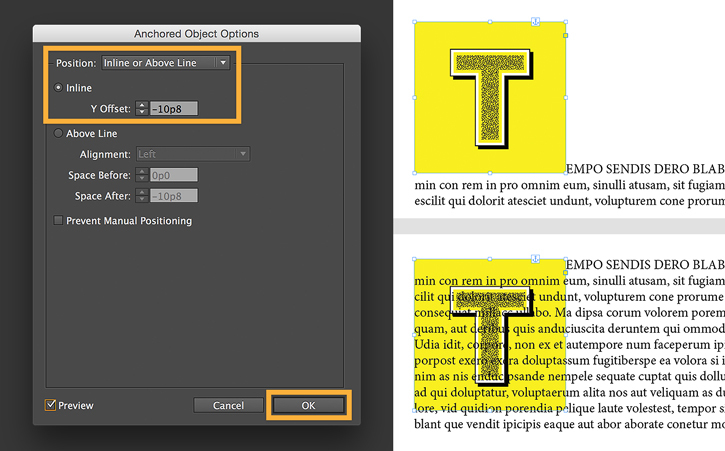 Alt/Option + click the anchor icon to access the Anchored Object Options dialog and select Inline or Above Line, and set the Y Offset to position your drop cap within the text frame. 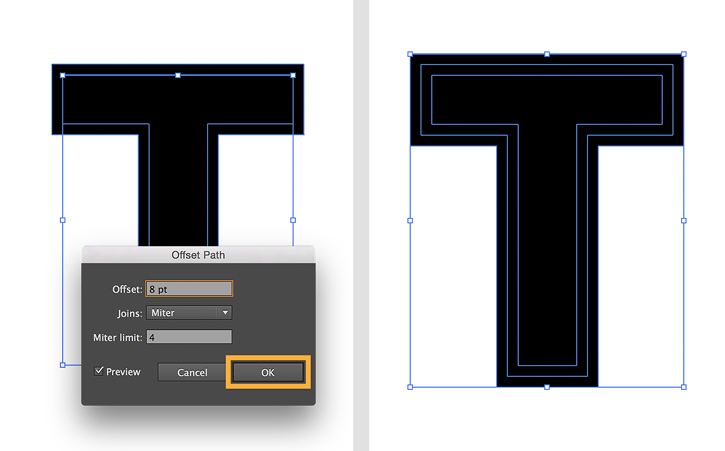 Select Preview and press the Up/Down arrows on your keyboard to set the Y Offset value visually. In the final step, you'll specify how the text will wrap around your drop cap. Go to Window > Text Wrap. 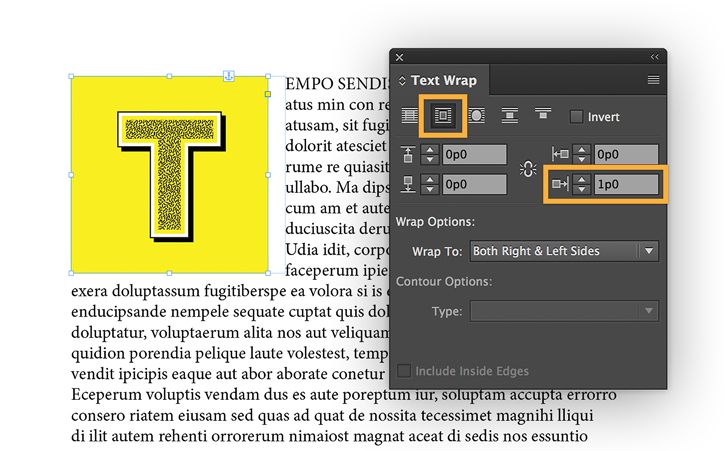 In the Text Wrap panel, click the second icon Wrap around bounding box. Increase the space between the drop cap and text by adjusting the Right Offset values. To change the Offset values independently, uncheck the link icon. Get inspired by our custom drop caps! We've created an entire alphabet of drop caps for you to experiment with and practice placing in your text layouts. To access the custom drop caps, click the Drop caps library. Click Save to Creative Cloud to create a copy of the library in your own account. Share your work on social media by tagging it #adobedropcap and view what others have made here.